Pionus birds like to be rained on and will hang themselves upside down and spread their wings to catch as many drops as possible. If you keep a pet Pionus parrot, mist it regularly. Make sure the bird is resting on a suitable perch with plenty of room to hang upside down and spread its wings. Compared to their body size, Pionus parrots lay really large eggs. Sometimes you can even see traces of blood on the first egg laid by a Pionus bird. Many Pionus keepers report how their birds love having the radio or TV on, and some individual birds even seem to develop a taste for certain TV-shows – such as wildlife documentaries and colorful cartoons. If you leave your bird alone during the day, use a timer to turn on a record that you know your parrot likes. This will help it pass time until you come back. Pet Pionus birds can often be seen dipping their food in the water try before eating it. 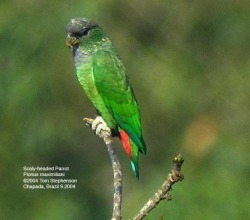 Unlike most other parrots, Pionus parrots do not have an oil gland above the tail. "Pionus Parrots." AC Tropical Fish & Aquarium. Web. 28 May 2010. <http://www.aquaticcommunity.com/parrots/pionus/>.